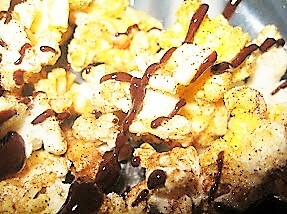 Snickerdoodle Popcorn with Chocolate Drizzle.. I'll wait while you re-read that! The cinnamon sugar coating is sprinkled on top of a vanilla-buttered popcorn. Then comes the chocolate drizzle. The layers of flavor just don't stop! It's so addicting! I first fell in love with this popcorn when I ran across the recipe for it with a white chocolate drizzle from Picky-Palate.com. I decided I must give it a try. When I went to make it, I discovered that my stash of white chocolate chips had been discovered and stealthily stolen! So, not to waste a good popcorn craving, went ahead and made it for you with some regular chocolate. The other advantage to that is, regular chocolate photographs better than white chocolate. I say you can't go wrong either way. The other tweak I made was I grabbed a bag of microwave popcorn instead of popping it from my popcorn popper. It made it quicker to get to the munching! Jan's tip: Grab an empty wax paper cereal liner bag to help with the making of this recipe, it'll make clean up a breeze! Pour Popped corn into an empty wax paper cereal liner bag. Drizzle butter over popcorn while shaking bag to mix well. In small bowl mix sugar and cinnamon together. Sprinkle over popcorn while gently shaking the popcorn bag to mix well. Lay bag on cookie sheet with the long seam of the bag facing up. Tear open the bag so the popcorn can lay flat and spread out on the wax paper. In small microwave safe bowl melt chocolate and cream (or shortening) for a few seconds at a time till melted and smooth. Drizzle chocolate over popcorn and let chocolate set. I assume you can take it from here! Munch, munch, munch.